This kind of statues appeared for the first time in Egypt as scenes with two dimensional representations in the beginning of the dynastic period. 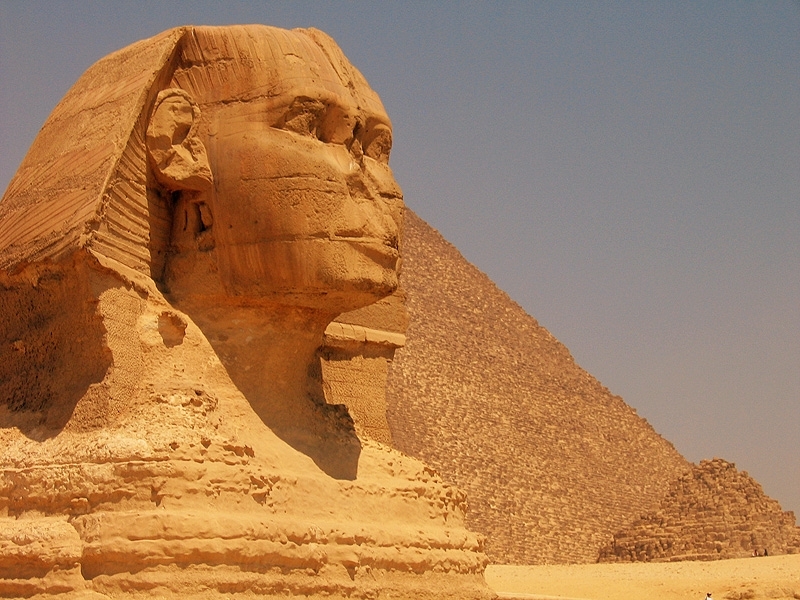 However, the first representative of the king in the form of a sphinx was in the Middle of the 4th dynasty. 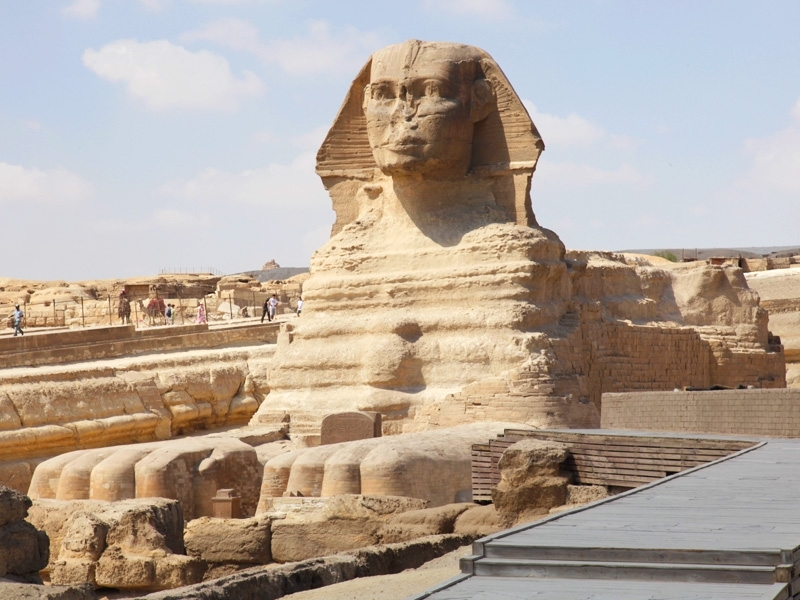 The first king who had a sphinx statue was King Djetef Ra, the successor of King Cheops, and it is considered as the 1st royal representation in the form of a sphinx. It was discovered nearby his pyramid at Abu-Rawash in El Giza and it is now kept in Louvre Museum. - Style of the Royal headdress "Nemes" was pleated all over its surface. While those of Chefren were partly pleated. - The Nemes it self was decorated with strap represented in high relief and its begging over the forehead in all the statues of Chephren and all the Kings afterwards, while the Great Sphinx itself had no decoration or even this strap over the fore head. - The representation of the Cobra itself on the Great Sphinx was partly depicted, just the out starched part of the Cobra only depicted on the forehead on the sphinx, while all the statues of King Chephren and all the kings afterwards had the representation of the whole Cobra with the body being depicted over the head. - The false beard, which is preserved now in the British Museum and Cairo Museum, it was represented plaited and curved, this type of divine false beard appeared in the New Kingdom which make the scholars to suggest that it was added as a separated part later during the New Kingdom in order to make the statue represent the divine form of a god who is Re hr 3hty as during this period the sphinx wasn't belonging to Chephren but it was Re hr 3hty. - The position of the sphinx it self, it was located on the south eastern part of the great pyramid of King Cheops nearby the remains of the quarries of this pyramid, but the Pyramid of Chephren has an angled caused way in order to avoid the quarries of King Cheops, so it isn't a straight cause way. And therefore being the sphinx sculptured from a remained rock of the great pyramid quarries then the sphinx should belong to King Cheops. - While an opposite opinion said that the sphinx belong to king Chephren as his name was mentioned twice on dream stela of Tuthmosis IV and his father Amenhotep II, while the name of Cheops was mentioned only one time. By all of these evidences, if we accept that King Cheops is the owner of the great Sphinx, so he will be the 1st one who had a sphinx in ancient Egypt and if we accept that the sphinx belong to Chephren it will be King Djdef Re who was the 1st one who had a sphinx all over Egypt. The sphinx statues were represented as a human head and body of a lion with the false royal beard and the names headdress. It was just representation for the king in the form of the Sphinx and the human head surrounded with the lion mane. The 1st King who represent him self in the form of a sphinx with lion's mane was Amenemhat III , in the second half of the 12th dynasty, Middle kingdom. The sculptures continue the Middle Kingdom methods, but they had added their touch which is the transforming of the fore legs of the declining lion into human arms holding a cult objects. Te first King who represented himself in such form was King Amonhotep III. 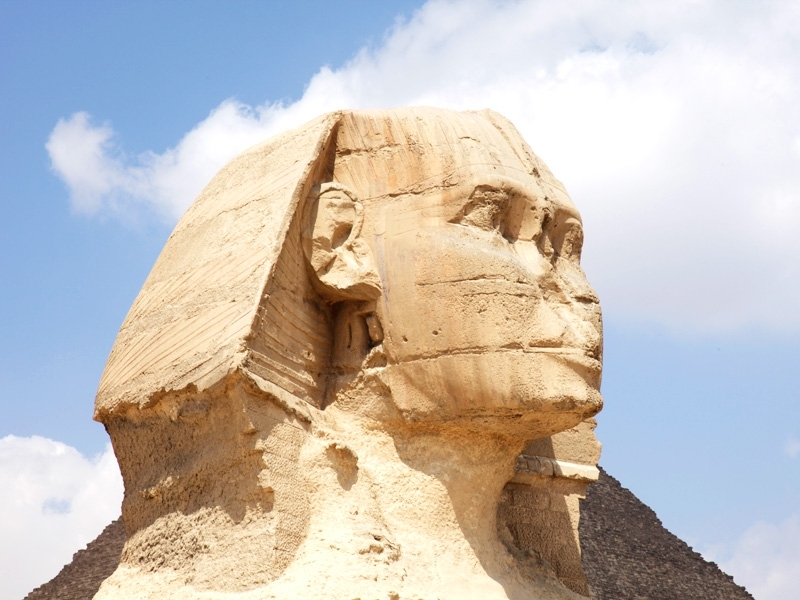 The word "Sphinx" is the Greek word of the original Egyptian name "Ssp Ankh" which means the living image, according to this name we can suggest that they mainly represent the king I his living image which the combination between the mental power and the Physical power. The mental power represented in the human head while the physical power represented in the Lion's body. If the sphinx is God, so it is said that the ancient Egyptians managed to tame the violent characte5r of the lion with the human intelligence turning it into a divine calm power. 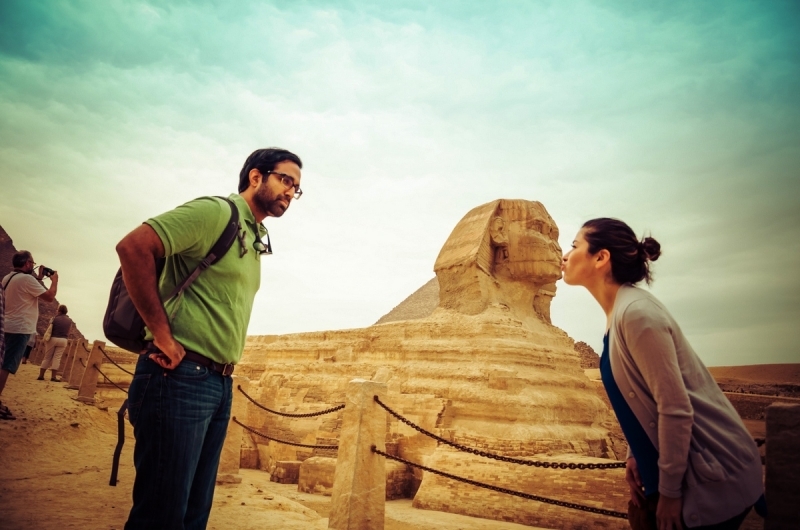 Since the beginning of the 4th dynasty the sphinx statues were considered guardians of the cemeteries and it clearly appeared in the position of the great sphinx in the beginning of the royal cemetery at Al Giza Plateau. 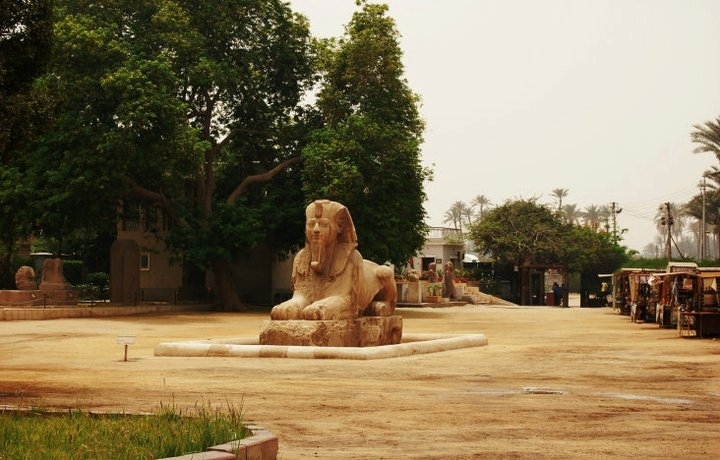 Moreover the royal sphinxes as well as the divine sphinxes were considered as protectors for processional routes connecting between two temples such as the sphinxes of the Karnak temples and also the templeof God Ptahand the serabium temple at Memphis. This function is the representation of the life cycle, according to one of the book of the dead chapoters. They represent two sphinxes back to back one of them was called Sp while the other one is called Dwa and between them the 3ht. "Sp " means yesterday, "D3w " means tomorrow , and "3ht" means today. Comparing between this representation and the sphinx avenue, we will find that Sp on the right hand side, D3w on the left hand side and the 3ht is the route itself. Since the second half of the 12th dynasty, most of the powerful queens and princesses stared to have their own sphinx statues. The most famous sphinx statue for a lady or a queen was the sphinx statue of Queen Nefertiti wore a hair wig instead of Nemes and it was discovered in the eastern part of the Karnak complex near the ruins of the remaining parts of Aton temple. The sphinx statues continued to be produced for the Kings even during the Greek Roman period, and most of the Roman emperors got the Egyptian sphinxes and transported then to Europein order to decorate their cities and palaces.